Several years ago I proposed that Dayton join Denver in being one of the first to roll out the BCycle bike share system. It would have been about a $2 million investment, and would have put Dayton on the map in the news cycle as a major player and forward thinker in bik- sharing systems. Several community leaders expressed interest- but, didn’t seem to understand either the costs, the revenue model, or the impact- and especially not the reason behind the seemingly expensive system. 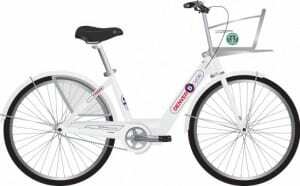 Why are the Bcycle bikes “so expensive” they’d ask? The $3,000 price tag per seat- that’s bike and docking stations- comes from having bikes that are sturdy, safe, easy to adjust, and trackable. Not just so they can’t get stolen (the value of stealing these Bcycle bikes is low- since no parts are interchangeable with other bikes- and special tools are needed to work on them)- and because they have accountability built into them- both with check-out records and GPS. 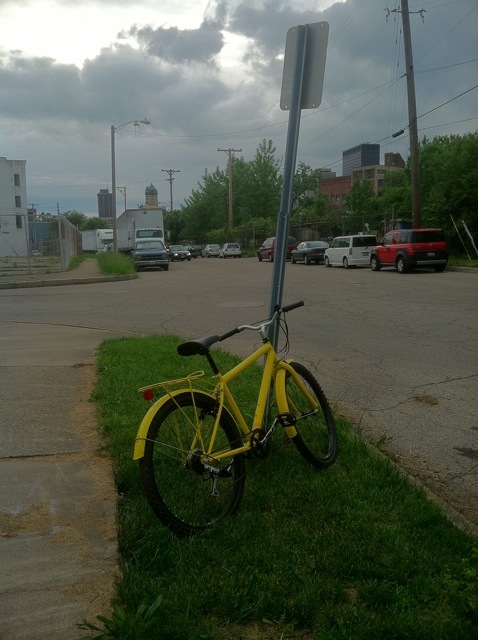 So, despite having major parking issues at UD, WSU, Sinclair, MVH, LexisNexis – and dealing with these issues with a real solution- we decided instead to roll out the “Yellow Bike” program. Yellow bikes are brightly painted bikes that are free- and randomly available around downtown. They hit the streets on the evening of the Spring Urban Nights. 50 bikes- free to be used. There are no signs explaining the program to riders- although there is a sticker on the bike with small disclaimer style text, and no way of keeping track of where they are, or aren’t. The bikes mostly seem to be an inexpensive mountain bike- far from the style of the Bcycle. The Bcycle has a basket for carrying items, a fully enclosed chain, full fenders, an easy step-through frame, easily adjustable seat and handlebar height, integrated light, bell and tracking system, The BCycle even has an integrated lock. The Yellow Bike has none of these- technically meaning you are riding them illegally if the laws are enforced (please see the post about the DPD harassing an intern for lack of bell and light from this site). The beauty of a real system like BCycle is that you can actually depend on bikes to be in strategic places and track availability. Also, since the system is a “managed one” the bikes are rebalanced throughout the system so that they are there when you need them- the “magic bike.” Yellow Bike has none of these advantages. In fact- because there are no time limits imposed, nor ways of tracking them, and the number of bikes on the street is easily a third of what the standard formulas would call for – for just downtown, what this could lead to is a “we tried it- and it didn’t work” answer when someone decides to get serious about this concept. Yet, we choose to do it half-heartedly. Is there anything Dayton DOESN’T do half-heartedly? David, your essay here seems less well-written than your standard efforts. Perhaps you’ll want to re-work it? David, as far as I know, this ‘program’ was the result of one guy–probably with some support from the bike advocates at the City–stepping up to the plate and making his idea happen without waiting on anyone else to do it. I went to visit Jeff Sorrell of the Life Enrichment Center a couple of years ago when he was just starting to think of various ideas for what he could do with the hundreds of bikes he had amassed through donations. A giant sea of bikes people (and Huffy) had given him. Yes, having garages full of bikes sounds pretty random, but if you’ve ever been to his massive LEC social-service compound you’ll understand. And yes, there’s a good chance people might steal the bikes, but I’ve heard that as a director of a faith-based charity helping low-income folks, he’s not so worried…if they really need the bike enough to steal, then he’s OK with that? Again, I haven’t been involved in the past year so I don’t know the details of how it came together, but I wouldn’t heavily critique what might be one very busy man’s dream of getting more bikes out there on the street. I’m surprised its being done at all. That B-Cycle program David is advocating is the way to go , but apparently there wasnt support to get it off the ground. Which is a sympton of a larger problem in our community; the lack of resources or willingness to commit resources to make things happen or support things when they do happen. This goes for projects, businesses, arts things, etc. So yeah we might think B-Cycle is a neat idea, but the people & institutions & businesses who can fund it apparently dont think its neat enough to put money behind. So, instead, as Kate notes, apparently this one guy and his non-profit decided to make something happen with what limited resources he has. Is something better than nothing? David things the failure of this Yellow Bike thing will give potential backers an execuse to say “no”to B-Cycle. But they havn’t backed it anyway, so machts nichts, I guess. So, right now, we have a shoestring ad-hoc bike share scheme up and running. 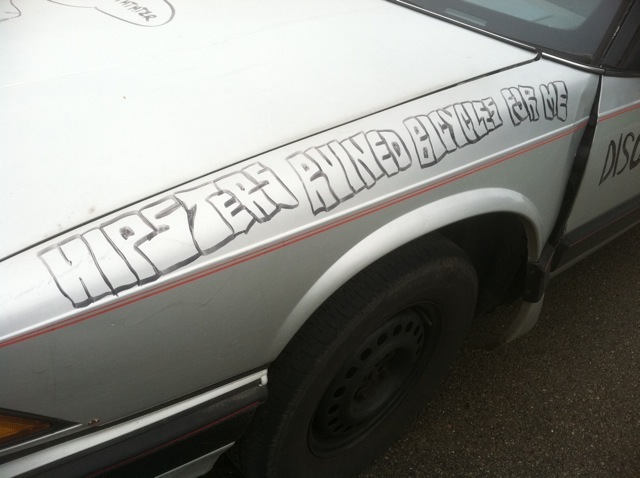 The yuppie hipster dig is divisive, silly, and beneath you. @Ruddick- sorry my writing is slacking, I didn’t know I was doing it for a grade. I slightly revised the end line. As I’ve pointed out before Jeff D- the use of public transit and bicycles can have a huge impact on the household budget (sorry, I can’t find the post right now- it showed that the cost of car ownership in the US equaled the cost of health insurance- coming in at third after housing and ….). A friend gave up his car for three years- and is able to go for years without work because of the money he is able to save. Cars are hugely expensive- as is the infrastructure to support them. The cost of commutes of 30+ miles everyday to our country is huge- because of the need to import oil from people who don’t like us much. Tax dollars invested in mass transit and alternative transit, as well as shortening commutes has huge paybacks to our entire economy- it’s not a hipster cause, it’s one of national defense. That fixie phenomenon has a big hipster component to it, so the hipster/bike connection is there. More a subculture/fashion thing. The bike stuff I’m more familiar with are the intiatives coming from the more activist or comitted side of alternative culture, things like bike shops, Critical Mass, etc. Coming out of the old DiY/anarchist/zinester world (and overlapping with that world). There is also a bike shop thing up in Chicago that is doing what’s being attempted in Dayton, teaching young folks on how to repair and build bikes. Dont have a link for it. This stuff is the part of the biking world I’ve become interested in. As you can see there is an aspect of social movement to it vs fashion statement or a form of recreation. Hah! That sounds like a great post! I’m learning that right now via using RTA. I still have a car but if I didnt I’d really be saving on insurance, too. My next step is to get a bike and try using RTA combined with a bike for things. I was thinking of using that Yellow Bike….the “banana boat”, as it was called by a patron of Bingers the other day….before I bought a bike but Im pretty tall and those bikes are not sized for big guys like me. As mentioned above, this project was conceived and is owned by the Life Enrichment Center, a faith-based non-profit in east Dayton (www.daytonlec.org) It’s one part of a larger Bike Shoppe program (http://www.daytonlec.org/services/bike-shoppe-safety-village/) which provides a number of programs that teach kids and adults how to ride and maintain a bike as well as bike safety. Mr. Sorrell, the ED, is a part of the bike/walk committee and has worked with his partners there to implement the program. His vision is to provide free bikes to the Dayton community, especially if it’s a new means of transportation for those who don’t have a car. He has met with the city, the police, and a number of other agencies to explain the program–they all know what to do if they see a yellow bike somewhere or someone riding one. He’s also partnered with some downtown businesses to provide bike racks with literature boxes. Off the top of my head, there are lit boxes with pamphlets describing the program outside of 5th Street Deli, on Sinclair campus, at Riverscape, and Olive, an urban dive (who generously reached out to Jeff to be a part of the program). These locations are where LEC will continue to introduce new or fixed bikes into the community. He plans on introducing large batches of bikes at every Urban Nights. Jeff and the rest of his team at LEC are doing really amazing things to make Dayton more livable for all of its citizens. He should be commended for using his resources and connections to create a new, free bike program. His work should not be denigrated just because he didn’t put in $2million work of bike infrastructure and his bikes aren’t as flashy. by the way, they are in all different styles from cruisers to mountain bikes. While I’m loathe to admit this, Mr. Esrati is spot-on in his yuppie/hipster dig. I participated in the pioneer years of Critical Mass in both San Francisco and New York City. W vioated any and as many traffic regulations as possible, creating vehicular bottlenecks galore. Confrontaions with the law were frequent. The then mayor of San Francisco, Willie Brown, initiated a police crackdown because we blocked an ‘official motorcade’ and made him late to a gala at the Bohemian Club. Mayor Bloomberg followed suit after the Critical Mass ride following that coincided with the 2004 Rupublican National Convention at Madison Square Garden. After that the law-n-order yuppie-hipster courteous mass types coopted Critical Mass. They agreed to pre-authorized routes and pledged to obey traffic regulations. Bicycle riding has gone totally legit in NYC. No fun in that. Dayton’s ‘courteous crass” is a yuppie/hipster cadre that will invariably impose itself on everyone else via October Revolution subterfuges. Of course, they’ll overplay their hand just like they did during the “Creative Class” insurgency. That said, the Themador in Dayton is inevitable. It was a Celina company. One of my greatest moments as a reporter was when the U.S.W. held its strike meeting in the Mercer County Courthouse auditorium, and I was screwed in under the stage. When the meeting was over, my wife got me out and the Daily Standard had a verbatim account of the move to strike. One of the reasons the SF Critical Mass was so disruptive was that the organizer was this anarchist/lefty guy named Chris Carlsson, who, before Critical Mass (or maybe there was an overlap) published the old Processed World zine, which did a great job of skewering the early days of “IT”. So he had sort of a f*ck the system/civil disobeidience POV going into it. Critical Mass was one reason I see the bike subculture having that anarchist/DiY/Punk/Zinester aspect to it. I’d agree with Donald about that co-opting thing,too, taming and defanging the edgier Critical Mass ethos. My next question is when will they set up a rack for pick up/drop off at Courthouse Square? Their flyer said this is being planned. Do they need money for it? On edit, upthread I forgot to post this link to BiciDigna, in Los Angeles. This is a pretty cool effort. I foun out about this at the US Social Forum up in Detroit last year…the people behind it gave a talk, panel discussion, and video of what they are up to. Part of the Q&A had bike shop/workshop people from ALL OVER the US, which woke me up that there is this bike subculture out there beyond the recreational riding culture we have here in Dayton. This is not faith-based group but it seems in spirit a bit like what the Life Enrichment Center is doing, more of an inner-city orientation, perhaps. @Jeff D CHS is managed by the County so I think LEC has to work with them to get a rack up there. Last I heard, Jeff at LEC was trying to build one out of spare bike parts….did I mention the folks at LEC are resourceful? So, uh, David…where’s your bike program? Cheers to this fella for actually doing something despite it “not being good enough” for you.